During demonstrations in Gaza on 14 and 15 May, 62 Palestinians were killed, including one health worker, and 2768 injured, including 8 children. However, the toll could have been even higher without a recent emergency health care innovation. Called ‘trauma stabilization points’, or ‘TSPs’, these large tent-like structures are located within minutes of the frontline and serve as the first point of care in the trauma-care pathway (from injury to pre-clinical trauma management, surgery and ultimate recovery). In a TSP, life- or limb-threatening cases are reanimated, stabilized, and then referred to hospitals for definitive further treatment. With these first crucial steps, TSP health workers can save additional lives in Gaza while taking some pressure off hospitals, which are being overwhelmed with injured patients. One such patient who came through a TSP is Waleed. Waleed was shot in his left leg during last Friday’s demonstrations and immediately brought to the nearest TSP only 3 minutes away. There, doctors determined the severity of his injuries, stabilized his wounds, administered IV fluids and analgesics, and prepared him for hospital transfer. After surgery, he will have to rest for several weeks and use crutches but with the intervention at the TSP, Waleed managed to avoid permanent damage to his leg, and possibly an amputation. In Gaza, the World Health Organization (WHO) has supported the Ministry of Health to upgrade the 5 TSPs close to the site of the largely peaceful demonstrations and enhance coordination with the additional 5 established by the Palestinian Red Crescent Society (PRCS). In addition, WHO provided medical supplies to Gaza including drugs, disposables and assistive devices for patients like Waleed. WHO also coordinates the Gaza Trauma Working Group, a coordination group which improves clinical standards, patient referral, and documentation of trauma patients. On 15 May, WHO also activated its global emergency medical teams (EMTs) network in order to more effectively respond to the humanitarian crisis. Waleed is far from the only injured person. Since the start of the demonstrations on 30 March, over 12 000 people have been injured, including 3500 who have gunshot wounds. 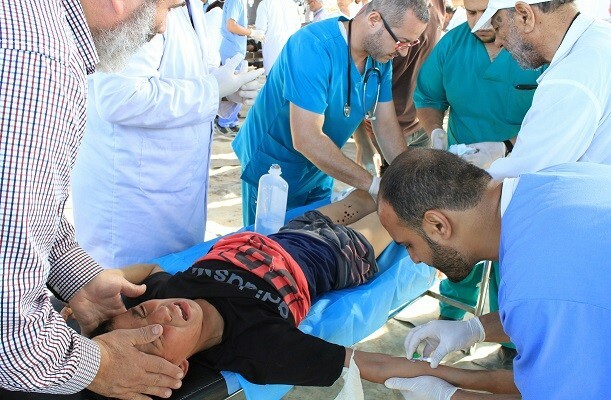 The influx of people with injuries has overwhelmed the healthcare system in Gaza, which was already in crisis before the demonstrations began; WHO reported in May that 40% of nearly 500 essential medicines were completely depleted in Gaza. In addition to TSPs and hospitals, specialist rehabilitation is a third key part of the trauma-care pathway. Dr Ahmad Shaheen, coordinator of the Al Awda hospital: “Many areas of Gaza have focused on the acute care elements of the trauma pathway. Yet, rehabilitation is critical.” With proper rehabilitation and help from specialists, Waleed and all other injured people in Gaza have a new hope for a full recovery and a healthy future.